A free radical is an atom or a group of atoms with an unpaired electron in its outer (valence) shell. These compounds are highly reactive in our bodies and quickly attack the nearest stable molecule by either donating or stealing an electron in order to balance themselves out. In the process of gaining or losing an electron, the formerly stable molecule is damaged and ceases to function properly. Even worse, this formerly stable molecule now contains an unpaired electron itself and thus becomes a free radical, reacting quickly with another nearby stable molecule. This process repeats itself over and over, creating a cascade of free radical destruction in our cells and DNA, and potentially contributing to every aging process, dysfunction, and illness known. Obviously, it is wise to limit our exposure to free radicals. Unfortunately, this is difficult to do, as many of the chemicals we are exposed to in the modern world generate free radicals in our bodies – radiation including electromagnetic radiation EMFs from common household electronics, such as phones, computers and televisions, heavy metals, pesticides, cigarette smoke, drugs, and air pollution. Processed foods, including heated oils, hydrogenated oils, iron from animal sources, and supplements (NOT plant-sourced iron), also generate free radicals. Too much sun exposure generates free radicals in our skin. Finally, our bodies generate free radicals during activities that are a normal part of living, such as digestion, breathing, and exercise. This last source of free radicals is of serious concern for endurance athletes, as the large amounts of oxygen that they consume during training and competitions often results in significant oxygen radical damage in their bodies, barring potent free-radical quenching foods or herbs to counteract it. Fortunately, our bodies have a natural defense system designed to prevent free radical damage that relies on compounds known as antioxidants. Antioxidants can intercede before the cascade of free radical destruction has a chance to do significant damage by either donating or accepting an electron in order to neutralize a free radical, without becoming an unstable molecule in the process. Our bodies naturally produce many different antioxidant substances, and we can absorb antioxidant compounds from fresh fruit, vegetables, herbs, and superfoods (such as Vitamineral Green™, Earth™, Spirulina Manna™, and Liver Rescue™). Since most modern diets contain processed foods and are deficient in fruits and vegetables, and because we are exposed to vastly more environmental toxins than our bodies were ever designed to handle, it is wise to consume a quality antioxidant product to boost our body’s ability to win the war against free radicals. One way to quantify the potency of an antioxidant is its ability to neutralize oxygen radicals, the most common type of free radical in our bodies. Scientists have developed an in vitro (test tube) test which measures the Oxygen Radical Absorptive Capacity (ORAC) of different foods. Although this test is important and has become the gold standard for determining the antioxidant capacity of a given food source, there is much more to a quality antioxidant supplement than high ORAC value. antioxidant product ever created. So many products tout benefits, but simply do NOT contain the actually effective botanicals, or quantities of them, to be effective. Antioxidant Extreme™ allows you to achieve the benefits that research shows these amazing nutritional substances can provide! Fat and Water Soluble. Contains abundant quantities of both fat (e.g., vitamin E, vitamin A, curcumin, and carotenoids) and water-soluble (e.g., vitamin C and flavonoids) antioxidants. Free radicals that are formed in the lipid (fatty) sections of our body (cell membranes) are handled by the fat-soluble antioxidants. Those that are formed in the watery or aqueous sections (blood and fluids within and around cells) are handled by the water-soluble antioxidants. ORAC. 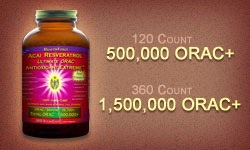 Based on truthful data, Antioxidant Extreme™ contains an extremely high ORAC value per dollar. The 120 VeganCap™ size contains over 500,000 ORAC/bottle and the 360 VeganCap™ size contains over 1,500,000 ORAC/bottle. Contains high amounts of trans-resveratrol, the biologically active form of resveratrol, a remarkable polyphenol found in various foods, including grapes, blueberries, and Japanese knotweed. Studies confirm the myriad, powerful, and far-reaching benefits of resveratrol. * Due to rapid metabolism and elimination, however, trans-resveratrol has low bioavailability in humans. In order to provide the maximum possible bioavailablity of this powerful phytonutrient, Antioxidant Extreme™ contains both resveratrol extract (50% trans-resveratrol) and the food source from which it is derived (whole food Japanese knotweed); plus, Antioxidant Extreme™ also contains Herbal Antioxidant Activators™. Antioxidants are rapidly destroyed when exposed to oxygen and light. Our EcoFresh Nutrient Lock Packaging™ (amber glass bottle with airtight metal lid with rubberized seal, VeganCaps™, and oxygen absorber) prevents oxidation and preserves the antioxidant properties (dramatic difference vs. other packaging methods). 100% whole food and whole food extracts. No isolated or synthetic vitamins, minerals, or compounds. Isolated compounds like ascorbic acid (synthetic vitamin C) are not absorbed well and have actually demonstrated pro-oxidant activity (i.e., they act like a free radical) at high doses. There are many different free radical compounds besides oxygen radicals (the type of free radical that the ORAC value is based on) that create damage in our bodies. Since a given antioxidant does NOT neutralize all the different free radical and oxidative substances, it makes sense to consume a variety of antioxidant-containing whole foods and whole food extracts which contain hundreds of different antioxidant compounds. A quality antioxidant supplement should have a wide range of beneficial compounds and antioxidants which reach far beyond the ORAC concept. Based on this understanding, we feel that Antioxidant Extreme™ is the most balanced, comprehensive, and ultimately effective antioxidant supplement on the market today. Eco Green Company. Recycled and recyclable glass. 100% post-consumer recycled label made withOUT chlorine and dioxin.